1. Add 3 tbs of olive oil to the non-stick pan and sauté the prawns, calamari and chicken separately, having seasoned them previously with salt and black pepper, and keep them aside. I always use this type of pan for the "sofrito" to avoid the mess of splashing oil all over the kitchen. 2. In the same pan, add 1-2 tbs of olive oil if necessary, sauté the onion until it becomes transparent, add the pepper and the artichokes until they start becoming golden and then add the shredded tomatos, season with salt and pepper and sauté the mixture until it starts becoming shiny and the oil starts separating from the “sofrito”, then move it to the paella pan that you have previously started heating on the stove. 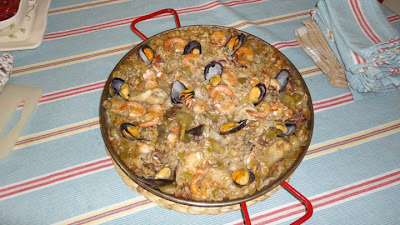 Add the cooked meat and fish to the sofrito and once the mix is warmed up and sticks together add the clams and stir. 3. At the same time steam the mussels in a separate pot until they are just cooked. Warm up the stock until boiling temperature. Separate the mussels in a plate and pour the juice from cooking them, into the stock. 4. Add the rice to the sofrito/meat/fish mixtures – 1 tea cup (1/2 cup in American measurements) per person and stir until some of the rice becomes golden. Add the saffron or sweet paprika and mix, they will contribute to intensify the flavour and will add color. 5. Pour the stock into the paella, twice the amount of rice plus one extra cup ( if you like juicy paella, you can add 1-2 extra cups of stock towards the end of the cooking period), stir the paella mixture until it is well mixed with the stock, make sure it is centred on the stove so it cooks evenly. Taste the stock and add salt if necessary. 6. Leave it cooking on the stove for about 20 minutes without stirring, or until the rice looks cooked. If the rice is not cooking evenly because of the size of the stove, shake it regularly and finish it of in the oven (previously warmed up to 450 degrees) for the last ten minutes. 7. 5 minutes previous to finish cooking, add the mussels distributing them decoratively around the pan. 8. Serve it with optional lemon wages to intensify the flavor. Born in Barcelona, has lived in Barcelona, Cambridge (UK), Belfast, Tarragona and Los Angeles. Catalan soul, World citizen. Cooking is one of my passions. It is part of my history, the flavours and aromas of my dishes bring memories of childhood, grandmas, celebrations, events, places and seasons. Cooking, for me, is like going home, a therapy, and a way to spoil family and friends. It is also how I share Catalan and Spanish cultures. Raquel Villero Pi. Simple theme. Powered by Blogger.